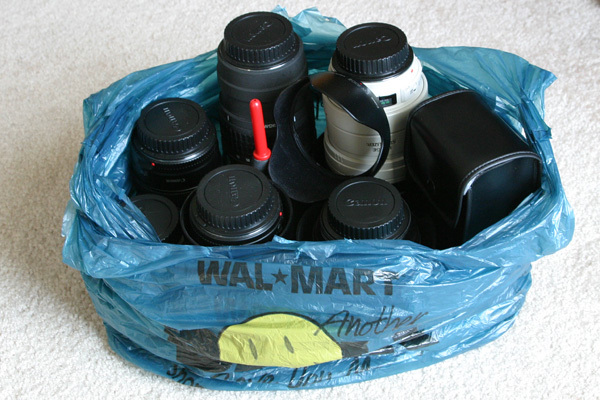 Do you have a photo of your camera bag with your gear in it? Please share! As a newbie, I have two dilemnas: what type of bag to buy, and how to arrange it. The thread above is for the Lowepro Minitrekker but I'm interesting in seeing other brands/models also. It was easy when I just had the 10D + 28-135IS. But now I have a few more lenses and what not which I need to fit in a bag. I bought a cheap back pack which was useless. Plus, I have a back pack for my laptop and I can't have two back packs while travelling (on the plane, for example). I bought a medium sized shoulder bag which I use now. It's a pain though for long walks as it gets quite heavy on one shoulder. Now that I have a FlashTrax, I don't need to bring my laptop anymore on holidays. So I'm looking to get a decent back pack. Looking at photos helps a lot, I think. It gives me ideas. I've got an older LowePro Onmi Traveller (It's discontinued now). I like it because it has padded dividers.. I carry 3 lenses, my flash, spare batteries, my filters, lens cleaning stuff, memory cards and my remote cable release... 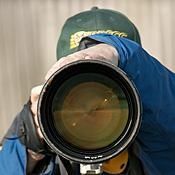 I have several large lenses that I carry seperately. Honestly, you don't want to see this. It is a Billingham 555, the best large shoulder bag made. 1D with a 100-400 attached, 10D with a 70-200 2.8IS attached, 17-40L, 24-70L, 50 1.4, 85 1.8, 2 TC's in the main compartment. Spare batteries (lots) and hoods in the front. Pod on the side with a FlashTrax. 300 2.8L IS, 500 4.0L IS, 85 1.8, 50 1.4, 1.4 & 2.0 MK-II TC. This is the Tenba DB-17C with a puch below for a 17" laptop too! Hernias are included in the sale price. Here are a few of the way I had it setup one day. Stuff is as follows: Canon EOS 10D w/ Big Ed, Sigma 120-300mm F2.8EX (monster lens) Canon 24-70mm F2.8L near monster lens, Canon 16-35mm F2.8L, 40GB FlashTrax Drive w/ extra battery, various filters, Canon EOS 50E (film), and more assorted camera kit. I obviosly didn't take these pics, I asked a friend to do it and he said that it would be ok. Thanks Snowman! OK, this is the largest of my bags. It's the one I usualy take if I have the big telephoto with me. It's a Lowepro Photo Trekker AW II. Cadwell, how do you carry your monopod ? It's a Billingham 306 (a smaller version of KennyG's 555) I love it - big enough for all my gear + planned purchases, comfortable to carry, and fantastically well made. In it are my 300D + Grip, 70-200 IS L, 28-135 IS, 50 f1.8 and (under the 50) the kit 18-44. Note the spare slot for the 17-40L when I recover from buying the 70-200, and adding a few padded flaps the 100-400 would sit nicley on top of the 70-200. It's deep enough for a flash and portable storage to fit in as well. It's also got 3 big pockets for filters, batteries, cleaning stuff etc. If any of y'all are interested, I can hook you up with my supplier. It sits in the tripod cup and is lashed to the side of the backpack by a couple of fasteners. Works quite well. The only problem with that bag is that it is fairly bulky but on the plus side it is very weather resistant. It's kept my gear dry in some prolonged torrential rain. I see this version has double walled protection. Very nice! Kenny, how deep is that bag?! I'm amazed you can carry that around! Canuck, thanks for your post! I was pretty much set on the Mini Trekker but this looks like a better option for me if it fits a laptop as well. It'll be much easier for me to bring my camera kit along on work related trips. Are there any other back packs that have room for a laptop? Tom, what can I say? If there's room in there for the camera body then I just might consider it. It fits: 10D + 17-40, 50 1.4, 28-138 IS, 75-300 IS, 420EX, FlashTrax, BP charger and a few other small bits. there are several backpacks that support a laptop. i am going from the tamrac pro 9 to the tenba d17. the d17 is a little bit bigger but i have added equipment and the tenba is more comfortable and i love the easy accessible side zippers. i have the tamrac backpack on ebay right now. Just your basic bag but you have to imagine a 300d in there, as its my only didgital. It kinda stradles the top with the zoom lense, hood underneath along with the nifty50, kit lense, and various accesories. Oh! also it came pre stained from a couple years of use. Only cost 10 bucks at the local used camera sture, which unfortunately is out of buisness.